Dog fennel, photographed at Yamato Scrub Natural Area, Boca Raton, Palm Beach County, in March 2016. For us humans, dog fennel, Eupatorium capillifolium, is a bit of a mutt, not pariicularly attractive and questionably useful. It's poisonous. Wildlife and cattle don't forage on dog fennel, and it can be a weedy nuisance if it becomes established in a pasture. On top of that it can harbor diseases that can infect crops. However, to one particular bug, the scarlet bodied wasp moth, dog fennel is the difference between life and death in a really, truly strange way. But more on that in a bit. 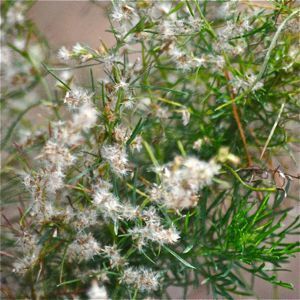 The name, dog fennel, comes from its superficial resemblance to the kind fennel commonly consumed in Mediterranean diets. It also contains chemicals that repel insects, and was strewn about dog pens to wardoff fleas and ticks. Hence dog fennel. Dog fennel is an extremely common plant, found in almost every Florida county, both Peninsula and Panhandle. Its native range extends up the east coast to Connecticut and west to Missouri, Oklahoma and Texas and back to Florida. 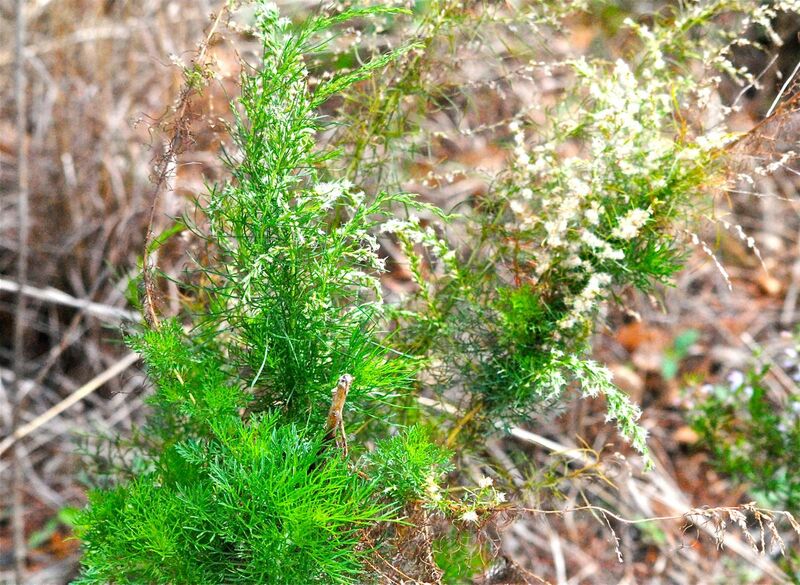 It grows in a variety of habitats, flatwoods and marshes to scrub. It is a tall, wispy plant, typically reaching four or five feet, but it can hit nine feet. It is a perennial but goes dormant during the winter, even in South Florida. It mostly flowers in the fall, setting fruit, such as they are, in late fall and early winter. The seeds are bits of fluff, perfectly designed to be dispersed by wind. Dog fennel contains pyrrolizidine alkaloids, which are toxic to birds and mammals, including people. Pyrrolizidines cause the veins in the liver to clog and retain fluid and ultimately fail. Our favorite Florida forager reports that some people have used dog fennel in small amounts as a seasoning without croaking. But he doesn't recommend consuming it at all. There is one animal that not only eats dog fennel, but must eat it, and that's the aforementioned scarlet bodied wasp moth. And it's the pyrrolizidine alkaloids he's after. The male of the species lights on the plant and promptly throws up on the leaves. This, according to Science Daily, dissolves the pyrrolizidines into a liquid, which the moth drinks and stores in a special pouch. He then finds a lady wasp moth and coats her with the concoction. The pyrrolizidines now protects both male and female moths by repelling potential predators, as they mate for the next nine hours. Yes, nine hours. The stuff continues to protect the two love bugs afterwards, allowing the female to lay her eggs in safety. Not only that, the pyrrolizidines protects the eggs from ants and other bugs that otherwise would see them as a tasty meal. To test how effective pyrrolizidines were in protecting the moths, they took one and placed it in the web of a banana spider. The banana spider cut the wasp from the web and set it free. You just can't make this up. 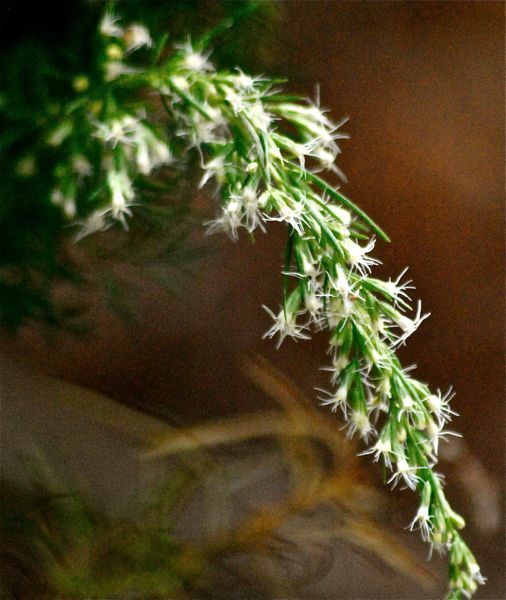 We saw some references that dog fennel is cultivated in some parts of the country and sold commercially as a landscaping plant, but to our knowledge not in South Florida. Dog fennel is also known as common dog fennel. Alternative spelling: dogfennel. It is a member of Asteraceae, the sunflower family.